Def Leppard have announced dates for a fall tour of Ireland and the UK. The 11-show run will open in Dublin on December 1 and see the Sheffield rockers perform their 1987 classic, “Hysteria”, in its entirety. “After many requests from fans in the U.K, I’m delighted that we can bring the whole “Hysteria” album to arenas across Britain and Ireland later this year,” says bassist Rick Savage. "From ‘Women’ to ‘Love and Affection’ plus many other faves thrown in for good measure. Oh, and our old pals Cheap Trick will be there also to help with the celebrations!! We can’t wait." 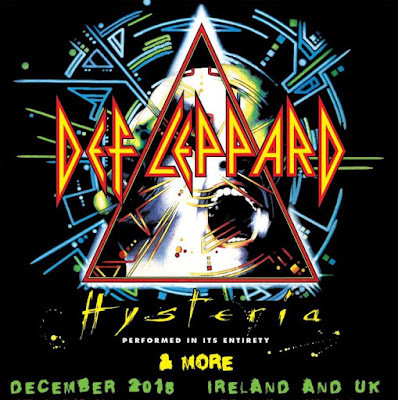 These will be the first Def Leppard UK and Eire tour dates since a sold-out arena run in 2015. A Rock Brigade Concert Club exclusive pre-sale & VIP Packages are available starting Wednesday, January 24, with general public tickets on sale beginning Friday, January 26 at 9AM local time. Last year, Def Leppard released a series of 30th anniversary reissues of “Hysteria”, the biggest-selling record of the group’s career with more than 25 million copies worldwide – including 10 million in the US. The band’s UK run will follow a newly-announced extensive, 6-month co-headlining tour of North America with Journey; the 58-city trek will mix arena and stadium dates and run from May to October.